When doing mobile cell phone repairing, you will often have to clean several points and connectors. Cleaning of points and connectors is done to clean and remove dirt and oxides from solder joints, PCB circuit tracks and the PCB itself. These dirt and oxides (often copper oxide and carbon oxide) act as resistance and hindrance to flow of current thus affecting the performance of the mobile phone handset. IPA solution or any other PCB cleaning solution or chemical. Fix the PCB to a PCB holder that can hold it firmly. Using a PCB cleaning bud or ESD-Safe Brush and IPA solution or PCB cleaner, clean the points and connectors on the PCB. You can also use tweezers to clean the points and connectors. Similarly you can clean the whole PCB of the mobile phone and other parts and components in a mobile phone. 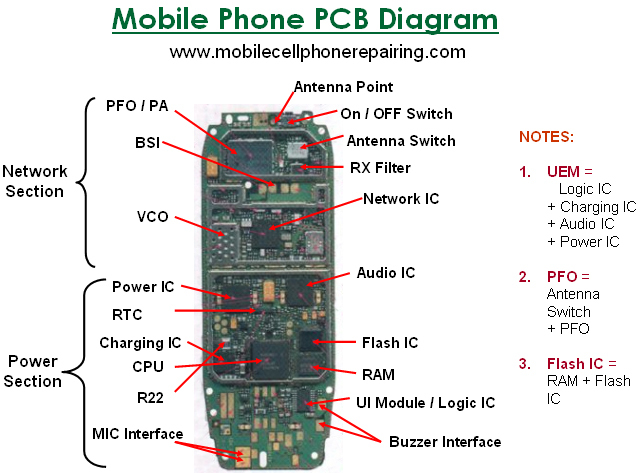 Have a look at following videos to learn and understand how to disassemble a mobile cell phone and how to clean points and connector of a mobile phone PCB. You will have to unlock the security code using software. Take your phone to any mobile phone repairing shop.